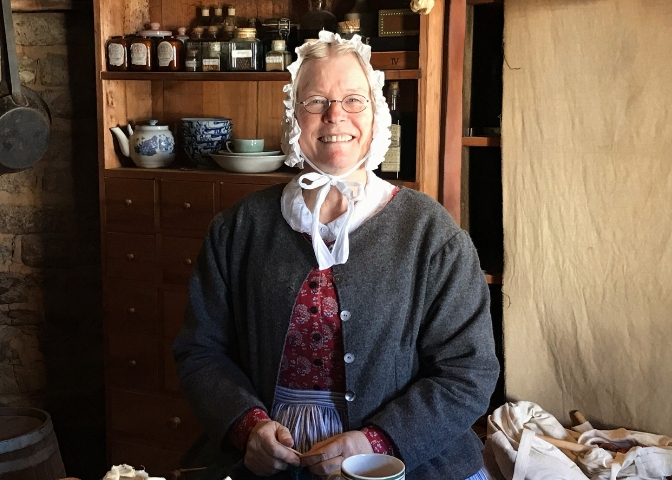 Eileen Hook (also known as Mrs. Talbott) has been a docent at Sutter’s Fort State Historic Park since 1980. Her love of interpretation and history at Sutter’s Fort has provided visitors with a lifetime of memorable experiences. I saw a demonstration of first-person interpretation at a workshop in 1979 and was immediately hooked. In June 1980, George Stammerjohan and I started the Sutter’s Fort Living History Program. I am the last of the original living history docents still active at Sutter’s Fort! I became an “official docent” with the first docent class in 1982/1983. Sharing the information I have learned through research and demonstrations of heritage skills. What is it that you do in your role as a Sutter’s Fort volunteer? I started out in the Immigrant Room as a pioneer woman and mother. Later I moved to the kitchen as an assistant cook and am now in the Period Trade Store as the storekeeper’s wife, I interpret the astonishing array of goods from all over the world that were available to early California residents. I am also the lead volunteer trainer for the women’s clothing section of the Docent training classes. I was Prince Philip, Duke of Edinburgh’s guide when he and Queen Elizabeth II toured Sutter’s Fort in March 1983. Rocking my daughter in the blue cradle in the Immigrant Room. The cradle was made by the Carpenter’s Shop in Sutter’s Fort and she was the first of many babies rocked in it. Churning many gallons of butter on the grass in the West Yard. Visitors; expressions when I tell them that what looks like a chocolate brownie on the Period Trade Store counter is actually chewing tobacco. What do you like to do in your spare time when you’re not volunteering? I am continually doing research on pre-Gold Rush California and immigrants’ journeys west. I hope to write a book from the woman’s point of view. I also do a lot of sewing as I have a small side business making period attire for early to mid-19th-century re-enactors. Thank you, Eileen, for your friendship and guidance over the years, and for your 5,062 hours of volunteer service! Learn how you can volunteer at Sutter’s Fort, or how you can support volunteer efforts.